Trypilian culture [Трипільська культура; Trypilska kultura]. 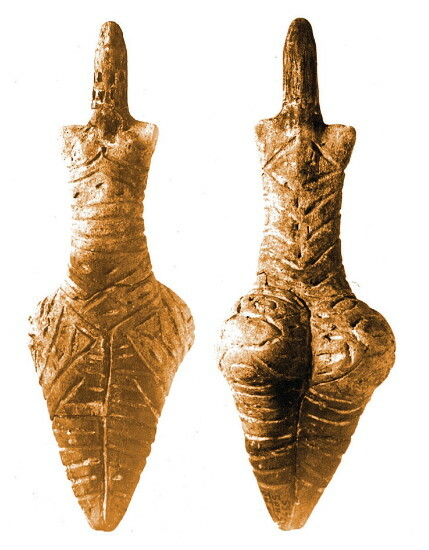 A Neolithic–Bronze Age culture that existed in Right-Bank Ukraine ca 5400 to 2000 BC. It is named after a site near Trypilia in the Kyiv region uncovered by Vikentii Khvoika in 1898. The Trypilians were primitive agricultural and cattle-raising tribes that migrated to Ukraine from the Near East and from the Balkans and Danubian regions. Scholars have identified three periods in the development of this culture—early (5400–3500 BC), middle (3500–2750 BC), and late (2750–2250 BC). 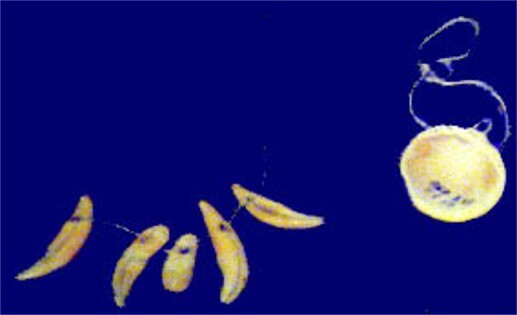 The differentiation of periods is characterized by an increase in population and the geographic spread of the culture: initially concentrated in the upper and middle Prut River and Seret (Siret) River and the middle Dnister River and Boh River basins, the culture spread in the middle period to include the right bank of the Dnieper River, and in the late period to the left bank of the Dnieper, the southwest steppe region, and the Sluch River, Horyn River, and Styr River basins. As it spread, the Trypilian culture assimilated the cultures of existing tribes. The periods are also differentiated by changes in settlement patterns, the economy, and the spiritual life of the people. 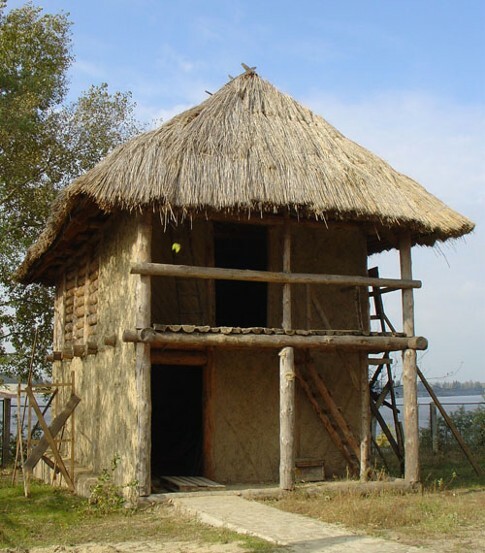 During the 6th millennium BC, Trypilian tribes began settling in low-lying riverbank areas and on plateaus in the Dnieper River and Boh River basins. They built pit and semi-pit dwellings with clay floors and hearths or ovens, and walls of wattle and dab. 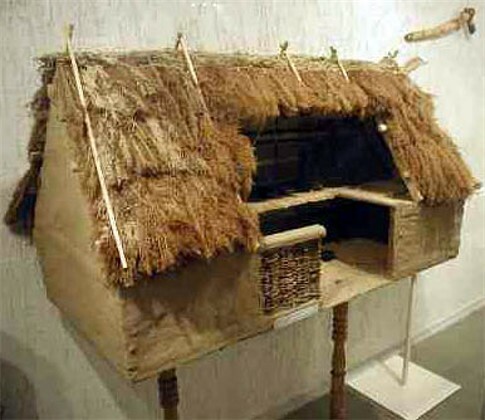 Rectangular surface dwellings, constructed with similar materials but on a raised log platform covered with clay and (probably) with a thatched roof, also began to appear at this time. 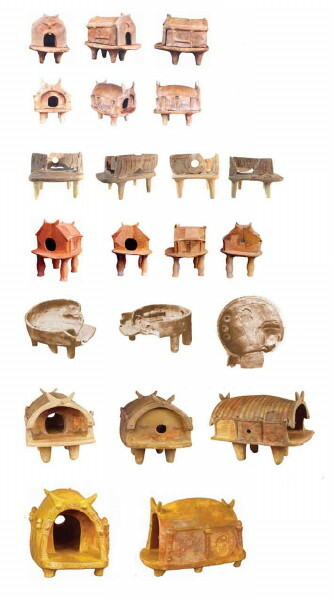 Clay altars, usually either round or cross-shaped, were also commonly constructed in dwellings (Kolomyishchyna, Volodymyrivka). Settlements were established by clans and contained 15 to 30 dwellings. Initially, extended families usually shared a single dwelling and houses were simply enlarged to accommodate new members, but from the middle period nuclear families generally occupied their own dwellings. In the later periods of the culture, settlements were usually established on high plateaus that were drier and more defensible, sometimes by moats and walls. These settlements were generally larger than earlier ones (eg, Volodymyrivka contained almost 200 dwellings). 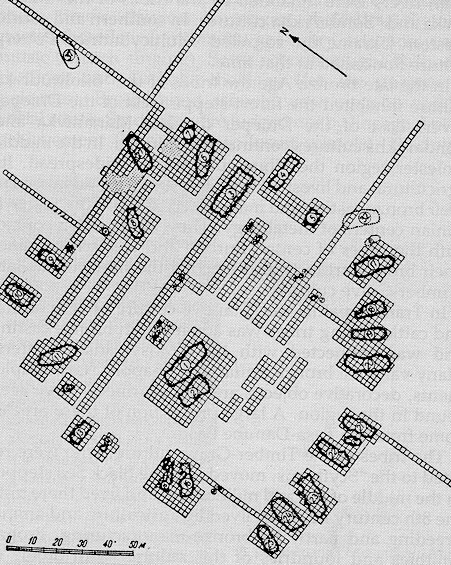 In later settlements houses often had a rounded floor plan, and they were arranged in a circle for defensive purposes and to pen livestock in a central enclosure. The major economic activities of the early Trypilians were primitive agriculture and animal husbandry, supplemented by extensive hunting, fishing, and food gathering. Wheat, millet, and barley were sown on land tilled with mattocks made from antlers or with digging sticks with sharpened points. Crops were harvested using bone sickles with flint blades and the grain was ground by stone querns. Horned cattle, together with pigs, sheep, and goats, were the most-domesticated animals; deer, wild boar, and roe deer were the animals most commonly hunted. 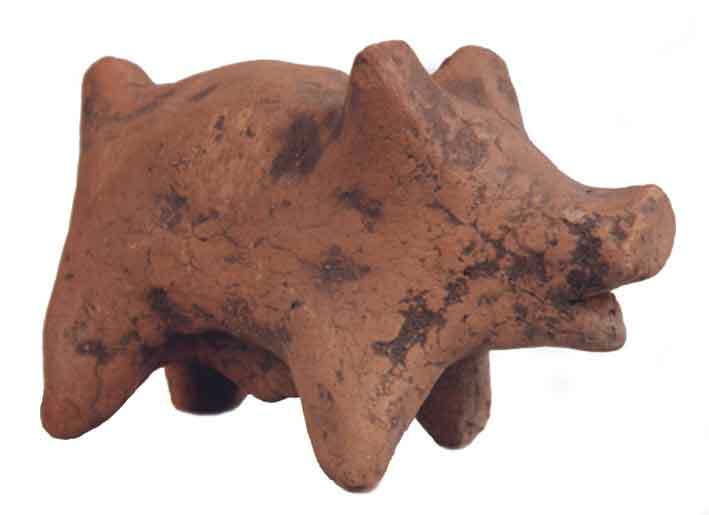 Animal husbandry emerged as the most important economic activity in the middle and late periods. This not only influenced the arrangement of dwellings in the settlement to protect livestock, but also led to the development of a pastoral lifestyle; the remains of many temporary settlements by floodplains and other grazing areas have been uncovered. The late period was also marked by the introduction of the domesticated horse. Although greater areas were brought under cultivation, agricultural techniques changed little. 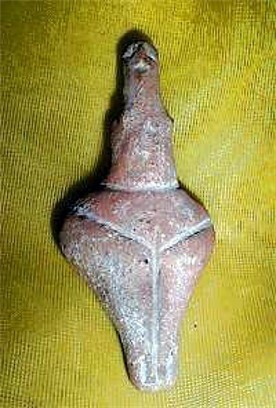 The basic tools of the Trypilian culture were made of stone, bone, and flint. Some small bronze items, especially fishhooks, bracelets, and rings, have been found at Trypilian excavations. The tribes of the culture traded with peoples in the Balkans or Transylvania (the source of copper found at Luka-Vrublivetska) and on the Aegean (this was especially true of tribes located in southern Ukraine). Weaving also developed, although the looms remained rather primitive. 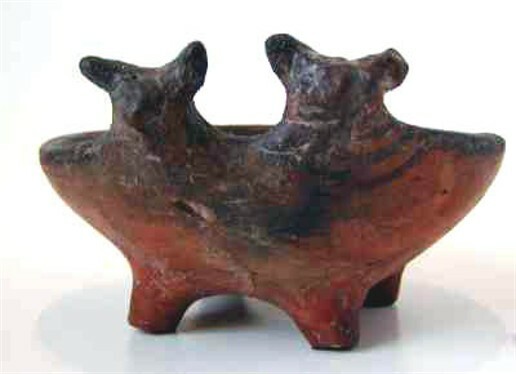 The Trypilian culture is especially known for its ceramic pottery. In the early period, handbuilt large pear-shaped vessels for storing grains, various types of pots, plates, spoons, colanders, and the like were all common. 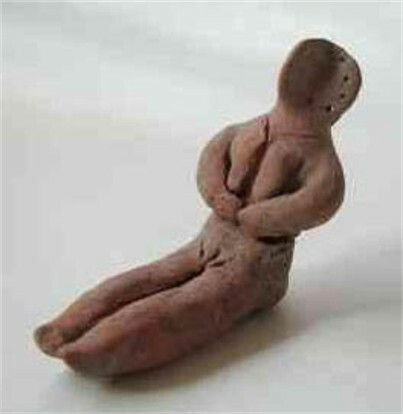 Earthenware was also used to make figurines of women, scale models of homes, jewelry, and amulets. 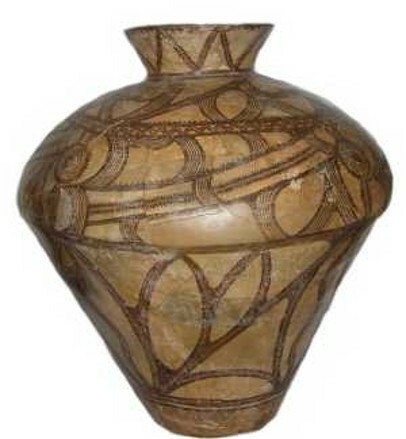 The exterior of the pottery was decorated with inscribed ornamentation in the form of spiralling bands of parallel double lines. 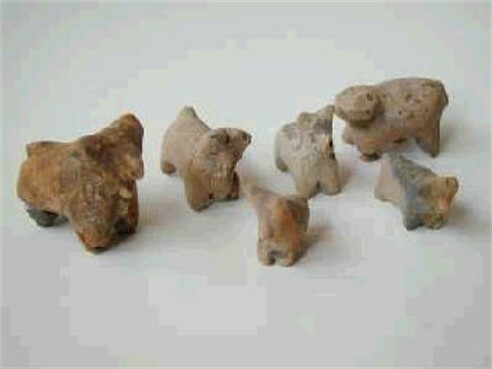 Most figurines were decorated with the same type of ornamentation. 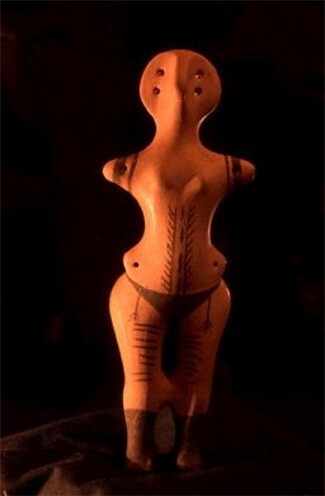 The figurines, house models, and amulets had ritual significance linked to an agrarian cult of fertility and prosperity. This cult, in turn, was linked to burials in homes. 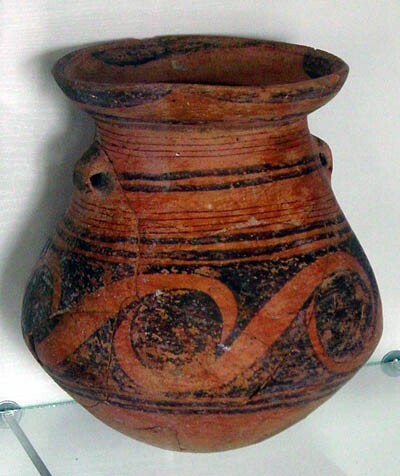 White, red, and black polychromatic spiral ornamentation was found on pottery unearthed at several early Trypillian sites (Kadiivtsi, Bavky, Kudryntsi, Frydrivtsi, and the Nezvysko settlement). 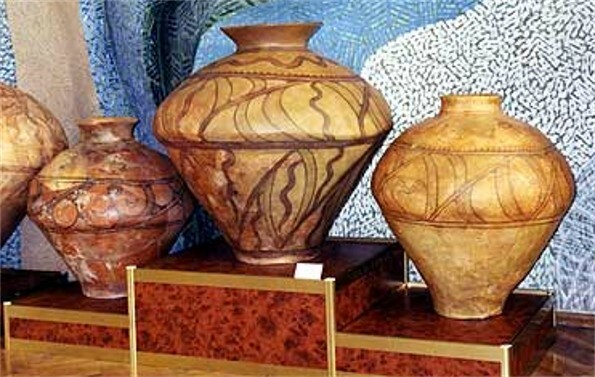 Pottery-making reached an especially high level of development in the middle and late periods of the culture. 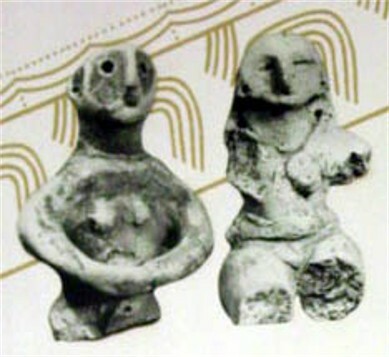 The Trypilians initially had a matriarchal-clan order in which women engaged in agricultural work, headed households, manufactured pottery, textiles, and clothing, and played a leading role in societal affairs, while men hunted, tended to cattle, and prepared tools out of flint, stone, and bone. Later, with the increase in importance of animal husbandry, a patriarchal order developed. As a result of incursions by other cultures (particularly the Pit-Grave culture) into Ukrainian territory in the mid-3rd to early 2nd millennium BC, many characteristic Trypilian traits changed or disappeared altogether. 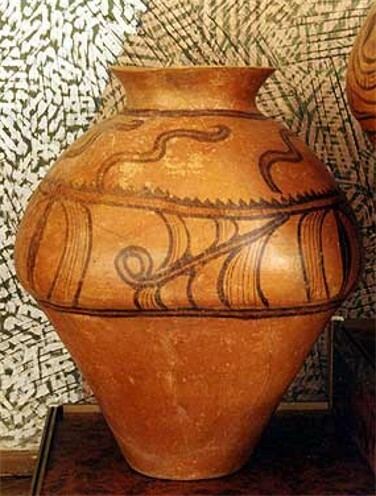 The technique of house construction was altered and the spiraling motif common to Trypilian pottery was replaced by corded designs. 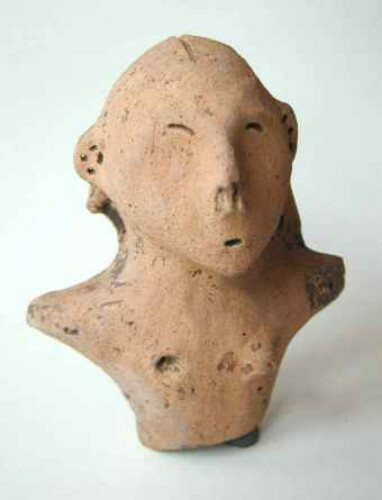 Anthropomorphic designs became schematized and older forms of pottery disappeared. Burial practices showed the influence of the Pit-Grave culture with its characteristic graves, tumuli, and patriarchal burial rites. The Usatove culture of the western Black Sea steppe region was assimilated by the Pit-Grave culture. 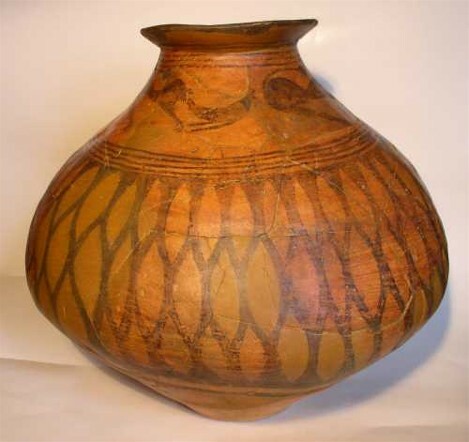 The historical fate of other Trypilian tribes was varied, as evidenced by the transition of tribes of the middle and upper Dnister River regions into the Globular Amphora culture during the middle Bronze Age. The Trypilian culture is perhaps the most investigated archeological culture in Ukraine. Hundreds of Trypilian sites have been excavated and studied. See, for example, the Lenkivtsi settlement, the Nezvysko settlement, the Oselivka archeological site, the Polyvaniv Yar settlement, and Molodove.